Your establishment may not have enough employees to keep pace with sudden increases in workload, like a sudden increase in orders around New Year. In this scenario you would probably be thinking to hire another worker, which becomes a constant expense and in the long run he/she may stay busy temporarily, He/she may have nothing to do after demand dies down. But hey, here is the solution to the issue named as Temporary staffing solution. Temporary employment means hiring an employee for a contracted period. 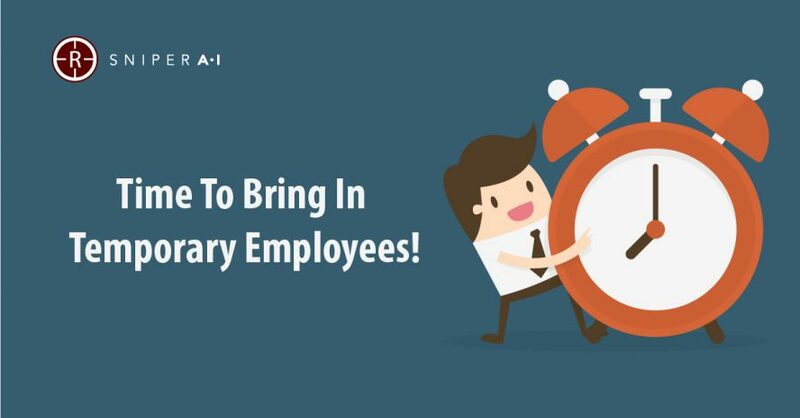 These temp workers fulfill all the functions of permanent employees and can assist during increases in demands, or when your full-timers take vacations or go on maternity leave. But, why should a business owner consider hiring temporary employees instead of a permanent employee? All you need to do is to pick up the phone today, and you can easily get someone in your office to take over the open role. When it comes to hiring someone for permanent it would take you weeks or months to get the perfect hire — and cost you time and money and also adding an extra burden on the employees. Temporary employees are flexible to approach for example if your office has employees that are out on vacation or maternity leave, a recruitment agency in this scenario becomes a good option to hire temporary employees to fill out the position of permanent employees, says Pawan Lokwani. Or, if you have a project that is due and you need some additional help, but you don’t want to hire somebody full-time or on a permanent basis. A staffing agency helps you to get the perfect person with best skills and ability to perform the task. According to the U.S. Bureau of Labor Statistics, the average direct cost for a new employee is $57,967.88 including basic wages, benefits, and taxes. The temporary workers are paid on an hourly basis which makes them seems to be more expensive in cost than paying to permanent employees but the costs associated with recruiting, hiring, and training add up fast. If that employee doesn’t work out for some reason, you are paying it all over again! During your peak times where you need more staff or the time where you need to reduce the staff or if holidays makes your business more hectic in functioning or if you are a manufacturer who suddenly landed a new contract? A temporary staffing company can help solve these hiring needs and staff for peak times easily by providing temporary workers and enabling a health-friendly environment. If you’re impressed with the temp’s performance, there may be an opportunity to hire them on a permanent basis. It’s not necessary that a temp worker will always be a temp worker there are many situations where temp workers are no more temp workers and they are hired as a permanent employee. As the time passes both the employee and employer will become more comfortable, and there will be less time spent on training and getting acclimated to the surrounding. If the temporary employee who enjoyed the moments working with your firm then he/she is going to share their experience of work in their network. A positive experience with your company is going to spread rapidly which will ultimately help in making a desirable reputation of the company. In addition, each temporary employee brings a unique network of past professional colleagues and experiences. Sharing those experiences could open up your company to new clients, vendors, suppliers and business partners. Temporary workers play an important role in every company they will not always be the right fit for your job. However, they are good as an option to be considered when the time calls them. You can save your valuable time and money to focus more on business efficiencies also you can also get your work done by temporary employees while you are in search of a permanent employee.